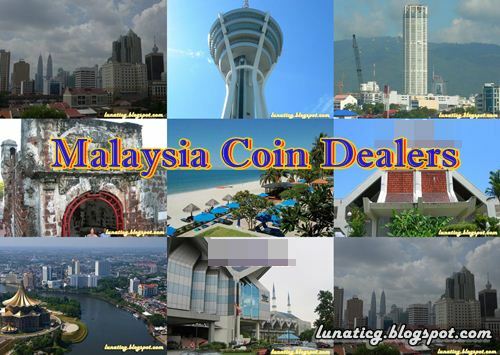 This post is a Coin Dealers list for Malaysia. Some of the dealers you can find in Malaysia Yellow Pages. Will try to update this list complete with their address, telephone numbers, emails, who to contacts. Here are the list of coin, paper money, banknote, accessories (album, Tweezers, Magnifiers, Microscopes, holder, capsules, cutter, watermark detectors, uv test lamp etc) and stamp dealer in Malaysia. Some of them also deals with Stamps, Postal History, Documents, Phone cards, Posters, Ang Pow, China antique ware, Antique & Various Collectibles.Will try to update this directory from time to time. If you have any information about coin dealers at your place, please email me at lunaticg[at]gmail.com or you can pm via Malaysia coin FB page. For updated version of this list, you can visit; Kedai duit syiling lama Malaysia. *Phone numbers and email removed from this article because most sellers interrupted by consistent phone call by non collectors asking about coin price and try to sell their coins & banknotes. Address: 2.4 & 2.5, 2nd Floor, Pertama Shopping Complex, Jln Tuanku Abdul Rahman, 50100 Kuala Lumpur, Wilayah Persekutuan. Address: Lot 327, Amcorp Mall, 18, Jalan Persiaran Barat, Off Jalan Timur, 46050 Petaling Jaya, Selangor. Address: 58, Jalan SS14/2, 47500 Subang Jaya, Selangor. Address: Ground Floor, G063A, Zone C, Millennium Square, Jalan 14/1, Section 14, 46100, Petaling Jaya, Selangor, West Malaysia. Address: LG 19 (next to Giant Supermarket), Amcorp Mall, 18, Jalan Persiaran Barat, Off Jalan Timur, 46050 Petaling Jaya, Selangor. Address: Lot 36, Blok B. Kompleks Muhibbah, Seksyen 24, Shah Alam. Business time: 12pm to 7pm. Closed on Monday & Tuesday. Address: No. 2-7, 2nd Floor, Plaza Metro, Jalan Meru ,41050 Klang, Selangor D.E. Address: Berjaya Times Square 07-47 Jalan Imbi, 55100 Kuala Lumpur. Address: Lot 6F/78, 6th Floor, Sungai Wang Plaza, Jalan Sultan Ismail, 50250 Kuala Lumpur. Address: Lot 07-50, 7th Floor, Berjaya Times Square, No: 1, Jalan Imbi, 55100 Kuala Lumpur. Address: Lot 07-30A, 7th Floor, Berjaya Times Square, No: 1, Jalan Imbi, 55100 Kuala Lumpur. Address: Lot 08-50, 8th Floor, Berjaya Times Square, No: 1, Jalan Imbi, 55100 Kuala Lumpur. Address: Lot 08-25, 8th Floor, Berjaya Times Square, No: 1, Jalan Imbi, 55100 Kuala Lumpur. Address: Lot LE2, LG Floor, Pudu Plaza, Jalan Landak, off Jalan Pudu, 55100 Kuala Lumpur. Address: D'Alamanda Shop Lot, No. 2-01-59, Jalan Pudu Ulu Impian 4, Cheras, Kuala Lumpur. Address: No. 115, Jln Sultan Idris Shah, 30000 Ipoh, Perak. Address: TF10, Complex Yik Foong, Jalan Laxamana, 30300 Ipoh, Perak. Address: A2-22, 1st Floor, Phase 1A, KOMTAR, 10000 Penang, Malaysia. Address: 76, Jalan Masjid Kapitan Keling (Pitt Street), 10200 Penang, Malaysia. address：S29, Tingkat 2, SP Plaza, Jalan Ibrahim, 08000 Sungai Petani, Kedah. Address: Ground Floor, SP Plaza Complex, Jalan Ibrahim, 08000 Sungai Petani, Kedah. Address : Lot 1-21, Tingkat 1, Village Mall, Legenda Heights, 08000 Sungai Petani, Kedah. No. 46, Jalan Tokong (Temple Street), 75200, Melaka. Address: E-2120-1, Jalan Dato Wong Ah Jang, 25100 Kuantan, Pahang. Kadoman Trading Co. Antiques & handicraft art. Address: 2nd Floor, Wisma Merdeka, Jln Tun Razak, 88000 Kota Kinabalu, Sabah, Malaysia. East Gate Art & Collection. No.1, Ground Floor, Raminway, 96000 Sibu, Sarawak.